After begging, pleading and multiple assurances that I really REALLY wanted to help, our good friend and fabulous cook, Vilma, asked me over to participate in the annual making of passata di pomodoro. I was on the invite like red on tomato - tomato sauce, that is. 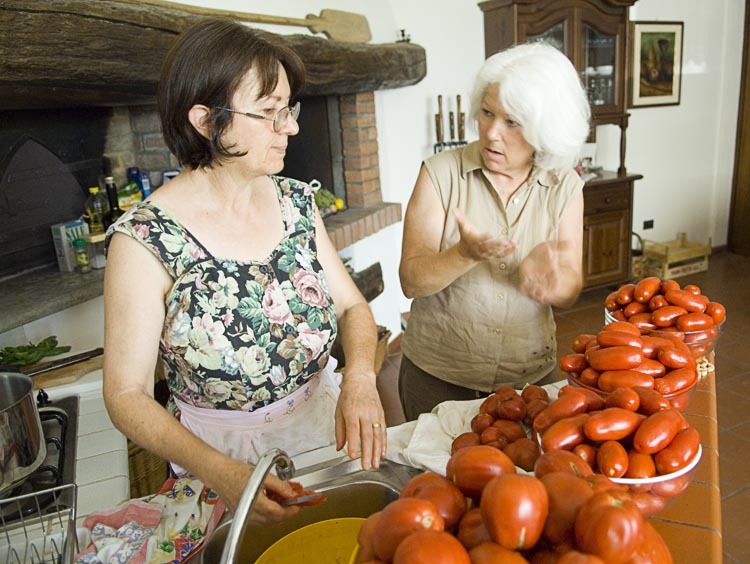 In kitchens all across Italy, bushel baskets of red, ripe tomatoes - picked minutes before from the family garden - are being turned into bright jewel-colored jars of passata di pomodoro (tomato sauce). 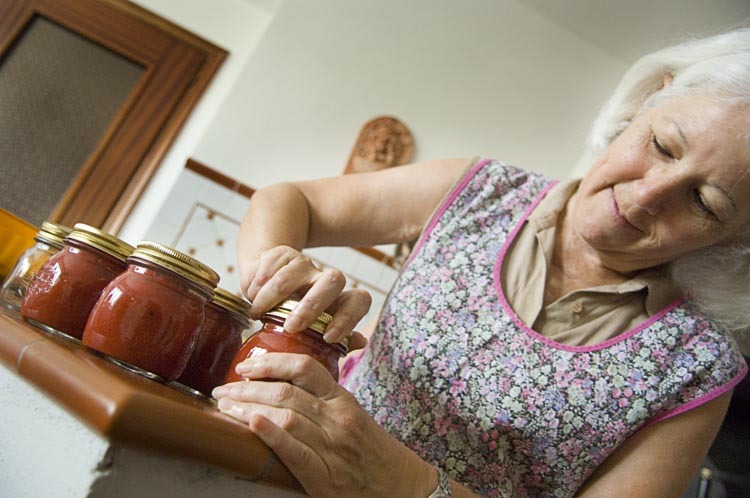 Last year Vilma put up over 150 jars, with each jar enough for two meals. But with pasta on the menu virtually every day (truly, that is not an exaggeration) and tons of other uses for this pantry stable, she has once again run out before this year’s crop was ready to harvest. Mama Mia! That’s a One Ton Tomato sauce! Vilma teaches me the fine art of canning, which she makes look so easy. It has always terrified me. I estimate it takes about 12 tomatoes for each jar of passato. This was her second round of canning this season and as more tomatoes ripen, Vilma will repeat this process 2 or 3 more times this summer. And that's only the tomatoes! Lucky us, not only did I learn how to process and preserve the precious pomodori, we were asked to dine afterwards. The typical Piemontese family meal started with tomatoes stuffed with tuna and a plate of salami. Our seconda piatta (second course) was a tender veal served with a mayonnaise made from eggs Vilma’s chickens had laid that morning. She feeds them the peel and seeds discarded from the tomato canning process. The yolks are a stunning reddish yellow that looks down-right artificial. After splitting and deseeding the tomatoes, they are boiled for about 10 minutes along with a few sprigs of basil and a little onion. The juice is discarded and the pulp is put through a foodmill which removes the skins. The filled jars are 'processed' in a water bath for 15 minutes where they remain to cool overnight before storing for a year or even more, if you don't run out before then! Three hours after sitting down to eat, I was regretting my lack of stomach space as Vilma encouraged me to take one more of her juicy and flavorful peaches (from her orchard, of course). She had marinated the peach halves in Moscato di Acqui, a local sweet wine, baked them, filled them with gelato, and topped it all off with shaved chocolate. The meal finally culminated with plump cherries soaked in a so-called digestivo, a take-the-top-of-your-head-off grappa kinda thingy. Did I mention the prima piatta (first course) of pasta with , of course, fresh pomodoro sauce? We could have stopped there and my stomach would have been happy and full. Looking forward to the day when I can put all of Vilma’s teachings to use with my own veggies! 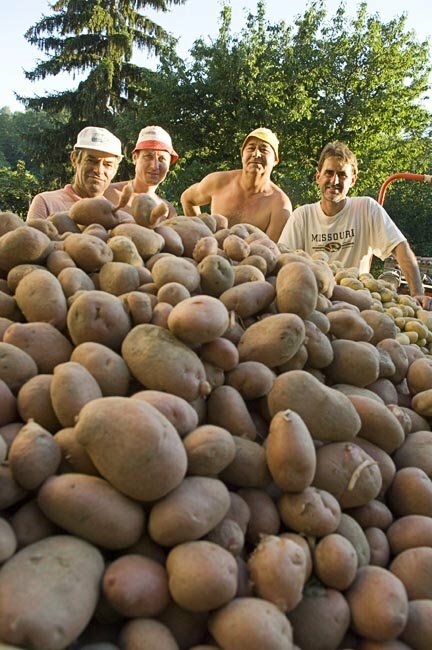 While I learned how to can, Chris helped harvest this mountain of potatoes in other friend's garden. Hopefully he learned something about gardening in exchange for a very sore back!